The Mac version of My Guitar from eMedia Music features a complete course of over sixty guitar lessons for children. 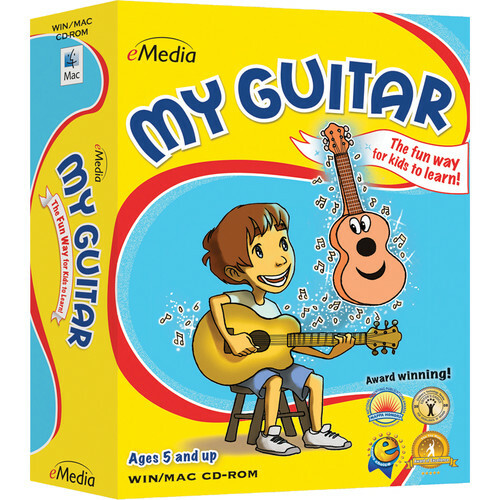 Guitarist and teacher Kevin Garry, Ph.D., along with the animated character Gary the Guitar, teach children how to tune the guitar, play easy guitar chords, read guitar tablature (a popular guitar notation) and play easy children's guitar songs. The Animated Fretboard shows children where to put their fingers as the music plays. Instant Feedback highlights notes as they are played correctly (requires computer microphone). In addition, the included music games let them have fun while they learn.